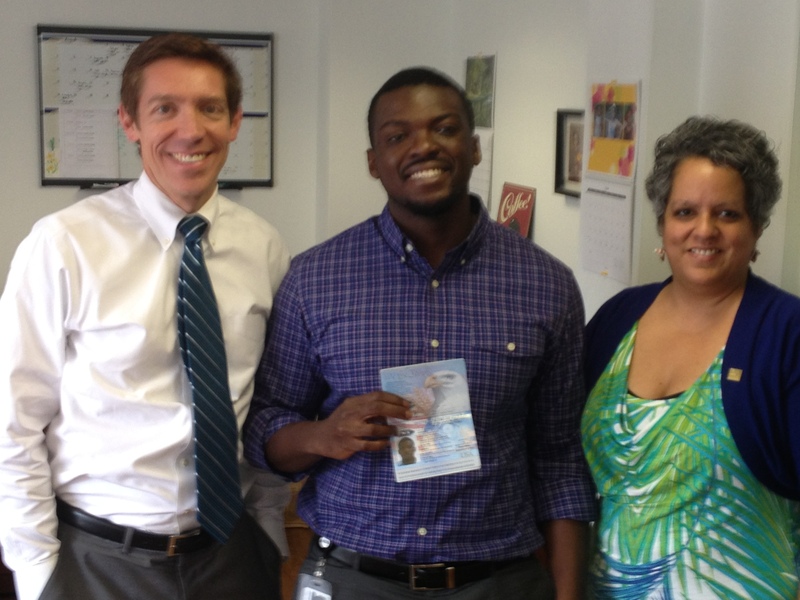 Last Friday in Baltimore, Maryland, our client, Temitope (“Tope”) Akinsade, was sworn in as a U.S. citizen. Naturalization ceremonies are always gratifying, but this event was particularly moving in light of the government’s relentless and ultimately unsuccessful effort to deport Tope – who has been a lawful permanent resident for over 12 years. To know Tope’s story is to understand both the unfairness of our immigration laws and the charade that is ICE’s supposed policy on prosecutorial discretion. A native of Nigeria, Tope came to the United States with his family as a 7-year-old in 1988. In 2000, at the age of 19, he pled guilty to a felony embezzlement charge after cashing three checks for some neighborhood toughs at the bank where he was working as a teller. Shortly after the incident, Tope reported the transactions to his supervisor and agreed to cooperate with the police and the FBI in their investigation. On the advice of his attorney, who assured him he would not be deported but would “become a citizen in five years,” Tope pled guilty to one count of embezzlement by bank employee. He was sentenced to one month in community confinement and three years of probation, which he successfully completed. Believing the incident was behind him, Tope enrolled at the University of Maryland, where he earned a bachelor’s degree in computer science with honors. He stayed at Maryland to earn a master’s degree, receiving a full fellowship from the National Science Foundation. Tope was then offered a slot in a leadership program at General Electric, working in the company’s Global Research Center in upstate New York. For several years he worked for GE and traveled to and from the U.S. without incident. Then, one morning in January 2009, Tope was arrested by ICE agents, charged with being deportable from the United States, and sent to a detention center in Batavia, New York. Authorities claimed that his embezzlement conviction qualified as an “aggravated felony,” which under U.S. immigration law means near-mandatory deportation. He was held for seventeen months before being released on bond. Although he had not been sentenced to prison for the underlying crime, Tope spent nearly a year and a half imprisoned by ICE, and he faced removal proceedings in immigration court without the right to an appointed attorney. Over the course of many months, Tope’s case ground its way through the notoriously slow workings of immigration court. An immigration judge sustained the government’s claim that Tope’s embezzlement conviction in 2000 met the definition of an “offense involving fraud or deceit,” and thus an aggravated felony. As a result, he not only was found deportable but also declared ineligible for virtually all forms of relief – including cancellation of removal – despite having been a green card holder for nearly nine years. The Board of Immigration Appeals affirmed the immigration judge’s decision. Tope then brought his case to the federal courts. He appealed the BIA’s removal order to the U.S. Court of Appeals for the Second Circuit in New York. At around the same time, he hired a criminal attorney to file a writ of error coram nobis in U.S. district court in Maryland, asking the court to vacate his embezzlement conviction based on the gross misadvice about immigration consequences he was given during his criminal proceedings in 2000. The district court judge found that Tope had received ineffective assistance of counsel, but ruled that he had not been prejudiced because the trial court gave a general warning during his plea hearing that if he was not a U.S. citizen, a conviction could lead him to be deported. Tope appealed the judge’s order to the U.S. Court of Appeals for the Fourth Circuit in Richmond, Virginia. His fate now rested in the hands of the two federal appeals courts. Tope’s fortunes finally began to change when Thomas Ragland took the case. Thomas filed briefs and presented oral argument in the Second Circuit, urging the court to vacate Tope’s removal order because the embezzlement statute under which he was convicted required proof of either an intent to defraud or an intent to injure – and the record of conviction was inconclusive as to Tope’s intent at the time of the offense. The government strenuously opposed these arguments, insisting that the conviction was clearly an aggravated felony and that Tope should be deported without delay. In May 2012, the Second Circuit issued a precedent decision agreeing with Thomas’ arguments that Tope had not been convicted of an aggravated felony, because both the immigration judge and the BIA had improperly inferred an intent to deceive in the commission of the embezzlement offense – which was not established by the record of conviction. In addition, given the relatively minor nature of the crime, the passage of time, and Tope’s exemplary achievements, the court also wondered aloud why ICE refused to favorably exercise prosecutorial discretion in the case. Finding that the government had failed to prove its aggravated felony charge, the appeals court vacated Tope’s order of removal. At the same time, Thomas also briefed and argued the coram nobis appeal in the Fourth Circuit. In July 2012, the court sustained the appeal and reversed the lower court’s ruling, agreeing with Thomas’ argument that a trial court’s general warning about deportation consequences at the plea stage was inadequate to overcome an attorney’s specific (incorrect) assurances to his client that entering a guilty plea would not render him deportable. Thus, in another precedent decision, the Fourth Circuit vacated Tope’s embezzlement conviction altogether. Federal prosecutors urged the en banc Fourth Circuit to rehear the case, but their request was denied. With a clean record – as both his removal order and his felony conviction had now been vacated – Tope submitted his naturalization papers last November. Several weeks after appearing with Thomas for an interview at U.S. Citizenship and Immigration Services, he was notified that his application had been approved. On Friday May 24, Tope took the oath of allegiance and became U.S. citizen. Tope spent over a year in ICE detention based on a single conviction that did not result in any jail time, and which ultimately was vacated by the federal court of appeals. And the government relentlessly sought to deport him based on an aggravated felony charge that evaporated under the glare of judicial scrutiny. In the past two years, ICE has stated that its personnel will use “prosecutorial discretion” to judiciously manage its expenditure of resources in immigration proceedings. In a memo published in June 2011, ICE Director John Morton outlined a series of factors to be taken into consideration when deciding to exercise prosecutorial discretion. Among these factors was the length of time spent in the United States, particularly in lawful status, the pursuit of higher education in the United States, whether the individual entered the United States as a child, whether the individual poses a national security or public safety concern, ties and contributions to the community, and whether the individual has cooperated with law enforcement. All of these factors weigh in favor of an exercise of prosecutorial discretion for Tope Akinsade, yet ICE refused and instead aggressively and persistently sought to deport him. It was not until the Second Circuit ruled in his favor that Tope was assured that his conviction, later held to be constitutionally unsound, would not prevent him from remaining in the United States. Fortunately, the federal appeals courts were persuaded by legal arguments challenging both the BIA’s removal order and the U.S. district court’s denial of coram nobis relief. The law prevailed where ICE’s discretion and common sense failed. Tope Akinsade is a proud and deserving United States citizen. These types of situations are all too common. Luckily this story had a happy ending. This is a perfect example of why it is so important to have the right legal representation. It can make a huge difference.